I came across an interesting site while looking for new information about how to use Excel for project management tasks and gather ideas for further improvements to GanttDiva. You should check out Victor Chan’s website, www.launchexcel.com . 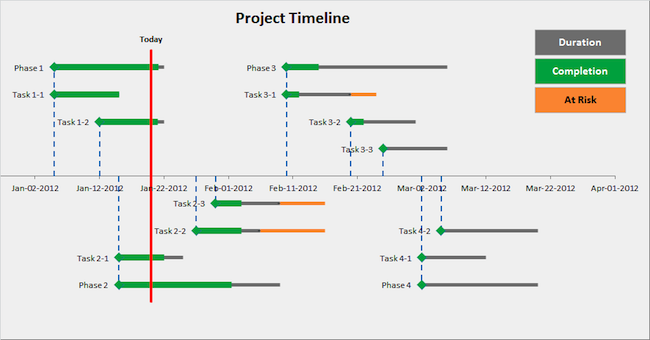 I particularly like the description of the project timeline as this is a very nice way of putting together a project roadmap that easy for people who are not familiar with Gantt charts. I have seen these produced using Visio, but maintaining them takes quite a bit of effort. The benefit of an excel based approach is of course that it is much easier to keep the chart in sync with changes in dates, labels, etc. In fact the whole approach lends itself to VBA automation and may make a nice report that could be generated from task information in a future version of GanttDiva. Victor has also included lots of productivity tips including some that I had not been aware of that will make my life a little easier. If you use Excel as much as I do, you quickly appreciate any opportunity to make your work a little easier. I use a lot of worksheets in my files and his tip on Right-clicking to show a worksheets list was a quick win for me. I have used his tips on bullet points to help spice up some of my own spreadsheets. Victor also has lots of useful links to other sites that have proven to be quite helpful. Overall the collection of information on his site combined with the video tutorials is a great resource for anyone who wants to step up to the next level with their excel skills. Victor has also created an ebook called Power Tips for Excel that contains lots of helpful productivity . I plan to check this out and will write another post about it shortly.